Been thinking about this for the past few weeks. It all started with the “4 King Fuzz” pedal that I did 6 months ago- 4 fuzz kings in one pedal. 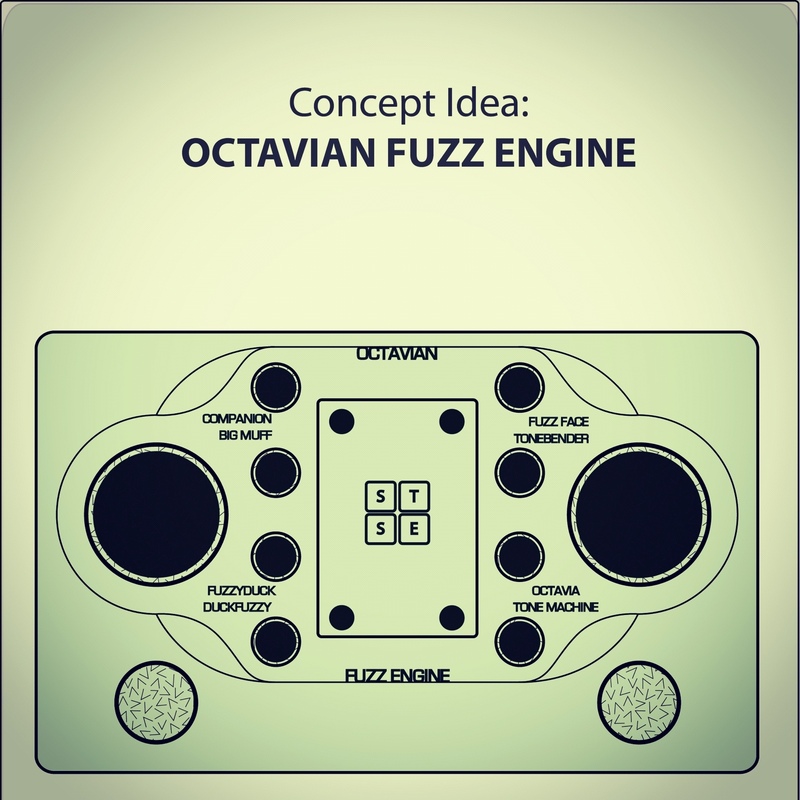 The Octavian is a continuation of that idea. The more I think about it, the more practically achievable it seems to become. 8 unique fuzz circuits in 1 enclosure. 4 choices on either side selectable by a rotary switch. Each side turned on/off by a stompswitch. 1. Fuzz circuits use a relatively small number of components yet have radically different sounds. 2. Efficiency – small circuits mean you can fit 8 in a box. 3. I like 8 fuzzes. I don’t have the pedalboard space for 8 fuzzes. I don’t have the patience to wire up 8 fuzzes. But aren’t there hundreds of different fuzz pedals out there? 99% of those cool hipster boutique fuzzes are hot rodded versions of classic designs. Usually the same sound but with modern conveniences like a smaller footprint, a 9V jack and an extra knob or two. I’m not hating, just emphasizing that the fuzz gene pool is a lot smaller than you might have originally thought. For example, there might be say 100 different commercially available fuzz pedals which are essentially a direct Fuzz Face. Taking the idea further, with 8 fuzzes in one box, I rate you could produce a giant chunk of the fuzz spectrum. 2 sides: each has a rotary switch switch with a stomp switch. A Volume knob for each circuit. A Gain switch for each circuit – selects one of 2 gain trim pots – still considering this. A cut-out on the front providing access to the rest of the knobs as trim pots. A panel sits over it fastened with thumb screws. Considering the fact that most people very rarely change their knobs from a few sweetspots, it’d be safe to leave everything but the volume as trim pots. Even more so for fuzz pedals. For example, an external switch for 2 Gain settings should suffice. The 2 Gain settings would be user definable with trim pots. However, I’m not one for opening the back of a pedal to mess with trim pots. I want it on the front. In order to be rugged enough to survive some live abuse, it’d need to be protected by a panel. Power – prevent hum and hiss from 8 circuits. A 4 pos, 3 position switch would provide the option to only supply the selected effect with power – thus minimizing any noise or hum to only 2 effects receiving power at once. So, which 8 Fuzzes make the cut? Why? No explanation needed – the original fuzz pedal. Why? Super harsh fuzz, no chords here! Sweet Ringmod sounds. Why? Could call this a “Distortion” but I rate it falls in the fuzz category. One of the most popular as well as cloned pedals out there. Circuit: 4 transistor gain stages with Diode clipping.